Salem's founder, Roger Conant, first came to the area, known as Naumkeag, in 1626. Oddly enough, the settlement, which eventually became known for witch trials and executions, was renamed Salem after the Hebrew word for peace. Interestingly, the witch trials, the defining series of events for which Salem became famous, lasted for just a bit more than a year. Today Salem embraces its history and has learned to make the most of it. 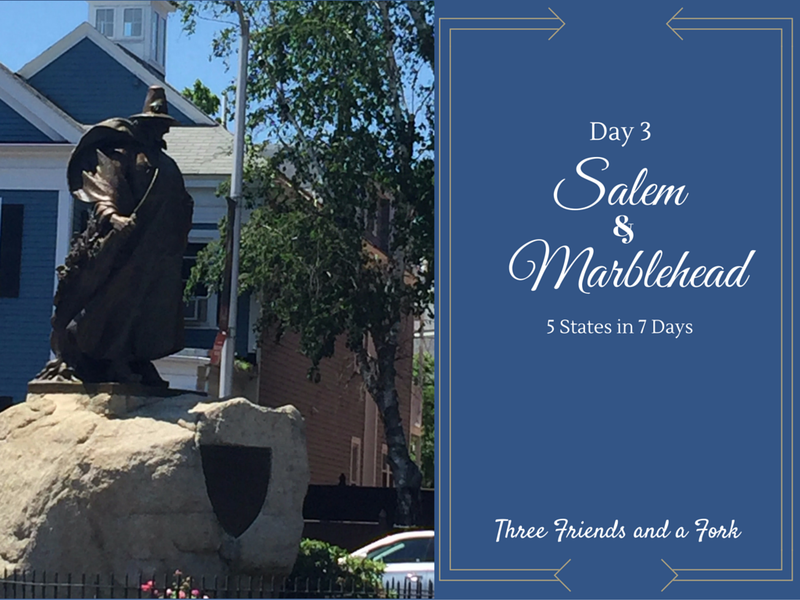 Along with the very real history of the witch trials, Salem gives a wink and a nose twitch to more lighthearted witch stories. In the very heart of downtown, a statue of one of television's most beloved witches, Samantha Stephens, from the 1960's sitcom, Bewitched, welcomes visitors to the city. We finally managed to come out of our sugar coma long enough to get back on course to the Witch House. Now, you might think from the name that at least one of the so called witches lived here, but, no. The Witch House was the home of one of the judges of the witch trials, Jonathan Corwin. After our tour of Salem, we decided to take the short drive to Marblehead. We went straight to Chandler Hovey Park where the Marblehead Lighthouse sits on a rocky point jutting out into the harbor. All the picnickers at Marblehead reminded us that we had not eaten in a while, so we headed back into Salem to grab a bite. While Dede and Carter looked for the local pizza place, I looked around for something else. What I found was a groovy little coffeehouse called Gulu Gulu Cafe. The name was enough to pique my interest, so I moseyed on in. 3 Hauntingly Good Yums UP to Caramel Patisserie, Gulu Gulu Cafe and Port Inn.